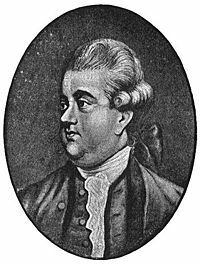 Edward Gibbon (April 27, 1737 – January 16, 1794) was an English historian and Member of Parliament. Gibbon is often referred to as the first "modern" historian; Gibbon's objectivity and accuracy in the use of reference material became a model for the methodologies of nineteenth and twentieth century historians. His most important work, The History of the Decline and Fall of the Roman Empire was published in six volumes between 1776 and 1788. The History is known principally for the quality and irony of its prose, its use of primary sources, and its open criticism of organized religion. It covered the period of the Roman Empire after Marcus Aurelius, from just before 180 to 1453 and beyond, concluding in 1590, and attempted to explain why the Roman Empire fell, outlining the behavior and political decisions that led to the decay and eventual fall of the Roman Empire in the East and West. Gibbon’s theory borrowed from the Roman moralists of the fourth and fifth centuries, who said that the Roman Empire succumbed to barbarian invasions because of a loss of civic virtue among its citizens. His treatment of Christianity as a historical phenomenon met with strenuous objections from the Church. Gibbon’s insistence on using primary sources wherever possible, his meticulous documentation of his research and his careful citations of all his sources set a standard for modern historians, who still rely on Gibbon as a secondary source. Edward Gibbon was born April 27, 1737  to Edward and Judith Gibbon in the town of Putney, near London, England. He had six siblings: five brothers and one sister, all of whom died in infancy. His grandfather, also named Edward, had lost everything in the notorious South Sea Bubble scandal, but eventually regained nearly all of it, so that Gibbon's father inherited a substantial estate. As a youth, Gibbon’s health was constantly threatened; he described himself as "a weakly child," and was near death several times. At age nine, Gibbon was sent to Dr. Woddeson's school at Kingston-on-Thames; his mother passed away shortly afterward. He then took up residence in the Westminster School boarding house owned by his adored "Aunt Kitty" Porten. He called her “the mother of his mind” and, sometime after she died in 1786, he recalled her imparting an avid "taste for books which is still the pleasure and glory of my life." Following a stay at Bath to improve his health, he was placed with tutors who did little to further his education. He accompanied his father on visits to the country houses of friends, where he had unrestricted access to libraries filled with old books, and discovered that history was his greatest interest. In 1751, Gibbon's reading was already indicating his future pursuits: Laurence Echard's Roman History (1713), William Howel(l)'s An Institution of General History (1680–1685), and several of the 65 volumes of the acclaimed Universal History from the Earliest Account of Time (1747–1768). and developed the habit of intellectual independence which stayed with him all his life. His health improved at adolescence and in 1752 at the age of 15, Gibbon was sent by his father to Magdalen College, Oxford, where he was enrolled as a gentleman-commoner. He was ill-suited, however, to the college atmosphere and later regretted his fourteen months there as the "most idle and unprofitable" of his life. But his penchant for "theological controversy," first inspired by his aunt, fully bloomed when he came under the spell of rationalist theologian Conyers Middleton (1683–1750) and his Free Inquiry into the Miraculous Powers (1749). In that tract, Middleton denied the validity of such powers; Gibbon promptly objected. As a result of that disagreement, and the influence of French Catholic Bishop Jacques-Bénigne Bousset (1627–1704), and of the Jesuit priest Robert Parsons (1546–1610), Gibbons converted to Roman Catholicism on June 8, 1753. He was further "corrupted" by the 'free thinking' deism of the playwright/poet couple David and Lucy Mallet; and finally Gibbon's father, already "in despair," had had enough. Within weeks, his father, angry because Gibbon’s conversion had legally disqualified him for all public service and office, removed him from Oxford and sent him to live under the care and tutelage of David Pavillard, Calvinist pastor of Lausanne, Switzerland. Gibbon later spoke of this change with gratitude, though his circumstances were austere; Pavillard was a kind and competent instructor and helped him to form regular study habits. He studied mathematics and logic and mastered classical Latin literature, as well as becoming familiar with French literature, which became a permanent influence on his style. In Lausanne he met one of his two greatest lifelong friends, Jacques Georges Deyverdun; the other was John Baker Holroyd (later Lord Sheffield). Just a year and a half later, on Christmas Day, 1754, he reconverted to Protestantism. The articles of the Romish creed,' he wrote, disappeared like a dream.' He remained in Lausanne for five intellectually productive years, a period that greatly enriched Gibbon's already acute aptitude for scholarship and erudition: he read Latin literature; traveled throughout Switzerland studying its cantons' constitutions; and aggressively mined the works of Hugo Grotius, Samuel Pufendorf, John Locke, Pierre Bayle, and Blaise Pascal. In Switzerland Gibbon also met Suzanne Curchod, the pastor of Crassy's daughter, who would later become the wife of Jacques Necker, the French finance minister. Gibbon and Mlle Curchod developed a mutual affinity, but marriage was out of the question, blocked both by his father's disapproval, and her reluctance to leave Switzerland. Gibbon returned to England in August 1758 to confront his father, who conferred an annuity on him but compelled him to break off the engagement. Gibbon later said, "I sighed like a lover, I obeyed like a son." He cut off all contact with Mlle. Curchod, even though she vowed to wait for him, and never again seriously thought of marriage. His father died in 1770, and after settling the estate, Gibbon had the means to settle in London, independent of financial concerns. Two years later he began writing in earnest, but not without the occasional self-imposed distraction. He took to London society quite easily, joined the better social clubs, including Dr. Johnson's Literary Club, and looked in from time to time on his friend Holroyd in Sussex. He succeeded Oliver Goldsmith at the Royal Academy as 'professor in ancient history' (honorary but prestigious). He entered the House of Commons representing Liskeard, Cornwall, in 1774, but became a "mute" and "indifferent" back-bencher, routinely and automatically supporting the ministry. Gibbon's inactivity in that position, perhaps intentional, interfered little with his writing. In 1776, after several rewrites, Gibbon, who said he had been "often tempted to throw away the labors of seven years," published the first volume of what would become his life's major achievement, The History of the Decline and Fall of the Roman Empire. The reading public eagerly consumed three editions for which Gibbon was rewarded handsomely: two-thirds of the profits on the first edition alone amounted to £490. Biographer Sir Leslie Stephen wrote that thereafter, "His fame was as rapid as it has been lasting." Regarding this first volume, Gibbons said that, "Some warm praise from Hume overpaid the labor of ten years." Volumes II and III appeared in 1781, eventually rising "to a level with the previous volume in general esteem." The final three volumes were finished during a retreat to Lausanne where Gibbon reunited with his friend Deyverdun in leisurely comfort. By early 1787, he was "straining for the goal;" and with great relief he finished the project in June of that year. Volumes IV, V, and VI finally reached the press in 1788. Contemporaries such as Adam Smith, William Robertson, Adam Ferguson, Lord Camden, and Horace Walpole were full of praise for his work. Smith remarked that Gibbon's triumph had positioned him "at the very head of (Europe)'s literary tribe." Following his completion of The History Gibbon returned to London to oversee the publication process alongside Lord Sheffield; publication was delayed to coincide with a party celebrating Gibbon's fifty-first birthday. In 1789, he returned to Lausanne, to learn of and be "deeply affected" by the death of Deyverdun, who had willed Gibbon his home. He resided there quietly, took part in the local society, received a visit from Sheffield in 1791, and "shared the common abhorrence" of the French Revolution. In 1793, when word came of Lady Sheffield's death, Gibbon immediately went to England to comfort Sheffield, the last of his close friends. His health began to fail in December, 1793. Gibbon is believed to have suffered from hydrocele testis, or a possible hernia. As his condition worsened, he underwent numerous procedures to alleviate the excruciatingly painful condition, but with no lasting success. In early January, the last of a series of three operations caused an unremitting peritonitis to set in. The "English giant of the Enlightenment" finally succumbed at 12:45 pm, January 16, 1794 at age 56, and was buried in the Sheffield family graveyard at the parish church in Fletching, Sussex. Although he published other books, Gibbon devoted much of his life (1772-1789) to one work, The History of the Decline and Fall of the Roman Empire. His autobiography Memoirs of My Life and Writings is devoted largely to reflections on how the work virtually became his life. He compared the publication of each succeeding volume to the birth of a child. The History of The Decline and Fall of the Roman Empire, a major literary achievement of the eighteenth century, was published in six volumes. Volume I was published in 1776, and went through six printings (a remarkable feat for its time). Volumes II and III were published in 1781; volumes IV, V, VI in 1788. The original volumes were published as quartos, a common publishing practice of the time. The books covered the period of the Roman Empire after Marcus Aurelius, from just before 180 to 1453 and beyond, concluding in 1590. They attempted to explain why the Roman Empire fell, outlining the behavior and political decisions that led to the decay and eventual fall of the Roman Empire in the East and West. Gibbon is often referred to as the first "modern" historian; his objectivity and accuracy in the use of reference material became a model for the methodologies of nineteenth and twentieth century historians. His pessimism and detached use of irony was common to the historical genre of his era. The book is famous not only because it is extraordinarily well written, but also because Gibbon offered an explanation for the cause of the fall of the Roman Empire. This was one of the great historical questions, and, because of the relative lack of written records from the time, one of the most difficult to answer. Gibbon took most of his ideas directly from Roman moralists of the fourth and fifth centuries, who wrote about Rome’s fall as it was occurring. According to Gibbon, the Roman Empire succumbed to barbarian invasions because of a loss of civic virtue among its citizens. Romans, he believed, had become effeminate, lazy, weak and unwilling to live a military lifestyle. The barbarian mercenaries hired to defend the Roman Empire became so numerous and ingrained that they were able to take over. Gibbon also attacked Christianity for creating the belief that a better life existed after death, which he said fostered indifference to earthly life among Roman citizens, and weakened their desire to sacrifice for the Empire. He also believed that the comparative pacifism of Christianity diminished the traditional Roman martial spirit. Like other Enlightenment thinkers, Gibbon regarded the Middle Ages as a priest-ridden, superstitious, dark age. It was not until his own age of reason and rational thought, it was believed, that human history could resume its progress. Gibbon provided the reader with a glimpse at his thought process by adding extensive notes along the body of the text, a precursor to the modern use of footnotes. Gibbon's footnotes are famous for their idiosyncrasies, providing an entertaining moral commentary on both ancient Rome and eighteenth-century Great Britain, and enabling Gibbon to compare ancient Rome to modern times. Gibbon's work advocates a rationalist and progressive view of history. Gibbon's citations provided in-depth detail regarding his use of sources, mostly documents dating back to ancient Rome. The detail within his asides, and his care in noting the importance of each document, are precursors to modern-day historical footnotes. The work is notable for its erratic but exhaustively documented notes and research. John Bury, following him 113 years later with his own History of the Later Roman Empire, utilized much of the same research, and commented admiringly on the depth and accuracy of Gibbon's work. It is notable that Bury, over a century after Gibbon, and Heather, over a century after Bury, both based much of their own work on Gibbon's factual research. Both found little to disagree with in his factual information, though neither accepted his theories, primarily the theory that Christianity was a prime factor in the Empire's decline and fall. Gibbon was notably not content with secondhand accounts when the primary sources were accessible, and used them so well that even today historians still cite his work as the definitive factual history of the western empire. I have always endeavored," Gibbon said in his own autobiography, "to draw from the fountainhead; my curiosity, as well as a sense of duty, has always urged me to study the originals; and if they have sometimes eluded my search, I have carefully marked the secondary evidence on whose faith a passage or a fact were reduced to depend." The criticisms upon his book… are nearly unanimous. In accuracy, thoroughness, lucidity, and comprehensive grasp of a vast subject, the History is unsurpassable. It is the one English history which may be regarded as definitive. … Whatever its shortcomings, the book is artistically imposing as well as historically unimpeachable as a vast panorama of a great period. When Volume I of The History of The Decline and Fall of the Roman Empire was first published, it was introduced in quartos. The first two quartos were well received and widely praised. The last quarto in Volume I, especially Chapters XV and XVI, were highly controversial. Gibbon attacked Christian martyrdom as a myth by deconstructing official Church history that had been perpetuated for centuries. Because the Roman Catholic Church had a virtual monopoly on its own history, its own Latin interpretations were considered sacrosanct, and as a result the Church's writings had rarely been questioned before. Gibbon, however, regarded the Church writings as secondary sources, and he eschewed them in favor of primary sources contemporary to the period he was chronicling. According to Gibbon, Romans were far more tolerant of Christians than Christians were of one another, especially once Christianity gained the upper hand. Christians inflicted far greater casualties on Christians than were ever inflicted by the Roman Empire. Gibbon extrapolated that the number of Christians executed by other Christian factions far exceeded all the Christian martyrs who died during the three centuries of Christianity under Roman rule. This was in stark contrast to orthodox Church history, which insisted that Christianity won the hearts and minds of people largely because of the inspirational example set by its martyrs. Gibbon demonstrated that the early Church's custom of bestowing the title of “martyr” on all confessors of faith grossly inflated the actual numbers. Gibbon further emphasized how insubstantial that number was, by comparing it to more modern history. He compared the reign of Diocletian (284-305) with that of Charles V (1519-1556) and the electorate of the Holy Roman Empire, making the argument that both were remarkably similar. Both emperors were plagued by continuous war and compelled to excessive taxation; both chose to abdicate as Emperors at roughly the same age; and both chose to lead a quiet life upon their retirement. Gibbon excoriated the church for two deeply wounding transgressions: displacing the glory and grandeur of ancient Rome ("supplanting in an unnecessarily destructive way the great culture that preceded it"); and practicing “the outrage of religious intolerance and warfare". Gibbon himself did not believe in revelation, or sympathize with those who did. He did not perceive particular danger in the activities of the churches; his main intention was to establish that religions should be treated as phenomena of human experience. Chapters XV and XVI were strongly criticized and resulted in the banning of the book in several countries. Gibbon was declared a "paganist." Gibbon's alleged crime was disrespecting the character of sacred Christian doctrine in "treat[ing] the Christian church as a phenomenon of general history, not a special case admitting supernatural explanations and disallowing criticism of its adherents." Gibbon, in letters to Holroyd and others, indicated that he expected some type of backlash from the church, but the harshness of the ensuing criticism far exceeded anything he or his friends could have anticipated. Pamphleteers ridiculed him for his ugliness and his elaborate clothes. Contemporary detractors such as Joseph Priestley and Richard Watson stoked the fire, but the most severe of these attacks was an intolerably "acrimonious" piece from the pen of a young cleric, Henry Edwards Davis, who accused him of falsifying his evidence. Concerned for his honor and anxious that the public read both sides of the dispute, Gibbon subsequently published his Vindication of some Passages in the Fifteenth and Sixteenth Chapters of The Decline and Fall of the Roman Empire in 1779. He categorically denied Davis' "criminal accusations," branding him a purveyor of "servile plagiarism." He left London to finish the following volumes in Lausanne, where he could work in solitude. Gibbon’s methodology was so accurate that, to this day, little can be found to controvert his use of primary sources for evidence. While modern historical methodology has changed, his skill in translation of his sources was impeccable, and contemporary historians still rely on Gibbon as a secondary source to substantiate references. His literary tone is old-fashioned, skeptical, and pessimistic; it mirrors both his own character and the topic under discussion, the gradual decay of a mighty empire. Gibbon is considered to be a true representative of the Enlightenment; this is reflected in his famous verdict on the history of the Middle Ages: "I have described the triumph of barbarism and religion." However, politically, he aligned himself with both Burke's rejection of the democratic movements of the time as well as Burke's dismissal of the "rights of man." It is generally accepted that Gibbon's treatment of Byzantium has had a detrimental effect on the study of the Middle Ages. There remains a question as to whether his poor analysis is primarily due to a lack of primary sources in this field or to the prejudices of the time. Gibbon's work has been praised for its style, his piquant epigrams and its brilliant irony. Winston Churchill noted, "I set out upon Gibbon's Decline and Fall of the Roman Empire [and] was immediately dominated by both the story and the style. I devoured Gibbon. I rode triumphantly through it from end to end." Churchill modeled much of his own style upon Gibbon's, though with less use of irony. Gibbon was also a model for Isaac Asimov in his writing of The Foundation Trilogy. Note: Gibbon continued to revise and change his work even after publication. The complexities of the problem are addressed in Womersley's introduction and appendices to his complete edition. David Womersley, ed., 1 volume (London: Penguin Books, 2000). Includes all footnotes and eleven of the original 71 chapters. ISBN 0140437649, 848 pages. ↑ The most recent and also the first critical edition, in 3 volumes, is that of David P. Womersley (Allen Lane, London; Penguin Press, New York: 1994). cited as 'Womersley ed., Decline and Fall'. For commentary on Gibbon's irony and insistence on primary sources whenever available, see Womersley, Intro. While the larger part of Gibbon's caustic view of Christianity is declared within the text of chapters XV and XVI, Gibbon rarely neglects to note its baleful influence throughout The History's remaining volumes. ↑ J.G.A. Pocock. Barbarism and Religion. vol. 1, The Enlightenments of Edward Gibbon, 1737–1764. (Cambridge: Cambridge Univ. Press, 1999 ISBN 0521633451), 29–40. At age 14, Gibbon was "a prodigy of uncontrolled reading;" Gibbon himself admitted that he had an "indiscriminate appetite" for books, 29. ↑ Edward Gibbon. Memoirs of My Life and Writings, Project Gutenberg. paragraph begins: "I hesitate, from the apprehension." . Retrieved May 15, 2008. ↑ Gibbon. Memoirs of My Life and Writings, Project Gutenberg. paragraph: "The use of foreign travel." Retrieved May 15, 2008. ↑ Gibbon lost the Liskeard seat in 1780 when his patron Edward Eliot, joined the opposition. The following year, owing to the good grace of Prime Minister Lord North, he was again returned to Parliament, this time for Lymington on a by-election. Gibbon also served on the government's Board of Trade and Plantations from 1779 until 1782, when the Board was abolished. The subsequent promise of an embassy position in Paris never materialized, serendipitously leaving Gibbon free to focus on his great project. ↑ so styled by the "unrivaled master of Enlightenment studies," historian Franco Venturi (1914–1994). see Pocock, EEG, 6; x. ↑ Gibbon's estate was valued at approx. £26,000. He left most of his property to cousins. As stipulated in his will, Sheffield overlooked the sale of his library at auction to William Beckford for £950. Womersley, ODNB, 17-18. ↑ Henry Edwards Davis, An Examination of the Fifteenth and Sixteenth Chapters of Mr. Gibbon’s History of the Decline and Fall of the Roman Empire. In which his view of the progress of the Christian religion is shewn to be founded on the misrepresentation of the authors he cites: and numerous instances of his inaccuracy and plagiarism a[re] produced, (London: J. Dodsley, 1778). Davis followed Gibbon's Vindication with yet another reply. ↑ Womersley, ed., Decline and Fall, vol. 1, ch. XVI, 516. Gibbon's first footnote here reveals even more about why his detractors reacted so harshly: "In Cyrene, [the Jews] massacred 220,000 Greeks; in Cyprus, 240,000; in Egypt, a very great multitude. Many of these unhappy victims were sawed asunder, according to a precedent to which David had given the sanction of his examples. The victorious Jews devoured the flesh, licked up the blood, and twisted the entrails like a girdle around their bodies. see Dion Cassius l.lxviii, 1145." ↑ Womersley ed., Decline and Fall, vol. 3, ch. LXXI, 1068. ↑ J.E. Norton, (ed.) The Letters of Edward Gibbon. (London: Cassell & Co., 1956), vol. 3: 1784-1794, #771, 5/2/91, 212-217. ↑ among a vast literature, see R. Jenkins Byzantium, ch. 1, (Toronto, 1987); S. Runciman, The Emperor Romanus, ch. 1, (Cambridge: 1988); J. Shepard, "Byzantine Soldiers, missionaries and diplomacy under Gibbon's eyes," in R. McKitterick, R. Quinalt, (eds.) Edward Gibbon and Empire. (Cambridge: 1997); Cyril Mango, (ed. ), "Preface," The Oxford History of Byzantium. (Oxford: 2003). ↑ Winston Churchill. My Early Life: A Roving Commission (London: T. Butterworth, Ltd., 1930). The History of the Decline and Fall of the Roman Empire. (vol. I, 1776; vols. II, III, 1781; vols. IV, V, VI, 1788). Memoirs of My Life (1796) found at the beginning of the posthumous Miscellaneous Works of Edward Gibbon, Esq. published two years after the author's death by his friend and literary executor Lord Sheffield; cf. Bonnard in References. Craddock, Patricia B. Edward Gibbon: a Reference Guide. Boston: G.K. Hall, 1987. ISBN 0816182175. Includes most secondary literature through 1985. Ghosh, Peter R. "Gibbon Observed," Journal of Roman Studies 81 (1991): 132–156. Ghosh, Peter R. "Gibbon's First Thoughts: Rome, Christianity and the Essai sur l'Etude de la Litterature 1758–61." Journal of Roman Studies 85 (1995): 148–164. McCloy, Shelby Thomas. Gibbon's Antagonism to Christianity. Chapel Hill: Univ. of North Carolina Press, 1933. Norton, J.E., ed. The Letters of Edward Gibbon, 3 vols. London: Cassell & Co., 1956. vol.1: 1750-1773; vol.2: 1774-1784; vol.3: 1784-1794. Pocock, J.G.A. Barbarism and Religion. 4 vols. : vol. 1, The Enlightenments of Edward Gibbon, 1737–1764. 1999 ISBN 0521633451; vol. 2, Narratives of Civil Government. 1999 ISBN 0521640024; vol. 3, The First Decline and Fall. 2003 ISBN 0521824451; vol. 4, Barbarians, Savages and Empires. 2005 ISBN 0521856256. all Cambridge Univ. Press. Pocock, J.G.A. The Work of J.G.A. Pocock: Edward Gibbon section. Retrieved May 15, 2008. Porter, Roger J. "Gibbon's Autobiography: Filling Up the Silent Vacancy," Eighteenth-Century Studies 8 (1)(Autumn 1974): 1–26. Stephen, Sir Leslie. "Gibbon, Edward" Dictionary of National Biography, vol. 21. Oxford, UK: 1921, 1129–1135. Trevor-Roper, H.R. "Gibbon: Greatest of Historians," Journal of the History of Ideas 1(Winter, 1968): 109-116. White, Lynn. The Transformation of the Roman World: Gibbon's Problem after Two Centuries. Berkeley: Univ. of California Press, 1966 ISBN 0520013344. Womersley, David P. The Transformation of The Decline and Fall of the Roman Empire. Cambridge: Cambridge Univ. Press, 1988 ISBN 0521350360. Davis, Henry Edwards. An Examination of the Fifteenth and Sixteenth Chapters of Mr. Gibbon’s History of the Decline and Fall of the Roman Empire. In which his view of the progress of the Christian religion is shewn to be founded on the misrepresentation of the authors he cites: and numerous instances of his inaccuracy and plagiarism a[re] produced. London: J. Dodsley, 1778. Ghosh, Peter R. "Gibbon's Dark Ages: Some Remarks on the Genesis of the Decline and Fall," Journal of Roman Studies 73 (1983): 1–23. Kelly, Christopher. "A Grand Tour: Reading Gibbon's 'Decline and Fall'," Greece & Rome 2nd ser., 44 (1)(Apr. 1997): 39–58. Trevor-Roper, H.R. "Gibbon and the Publication of The Decline and Fall of the Roman Empire, 1776-1976." Journal of Law and Economics 19 (3)(Oct. 1976): 489–505. Wootton, David. "Narrative, Irony, and Faith in Gibbon's Decline and Fall," History and Theory 33 (4)(Dec., 1994): 77–105. The History of the Decline and Fall of the Roman Empire, Project Gutenberg. Based on the Rev. H.H. Milman edition of 1845.